(Preschool) Give each child a piece of Reynolds blue plastic wrap, a blue sheet of paper, and cotton balls, popped corn, or cloud shapes (See below). Have them glue the plastic wrap to the bottom of the page for water and the cotton balls or popcorn to the top of the page for clouds. Write the Bible on the picture when they are finished. 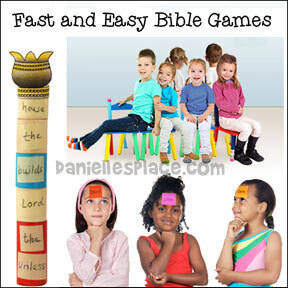 (Preschool - Second) Print out the Bible verse pictures and cut them out. Glue them to the center of a matching piece of colored paper. and let them decide which they want to use. You can also have them sponge paint with white paint to make cloud shapes. 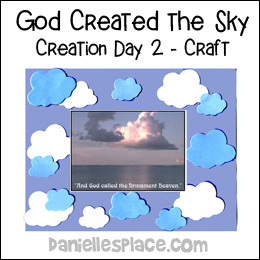 Children paint and add star stickers to jumbo craft sticks and glue a cloud picture with the Psalm 19:1 to the back of the craft stick frame. (First - Third) Print out the activity sheets before class. 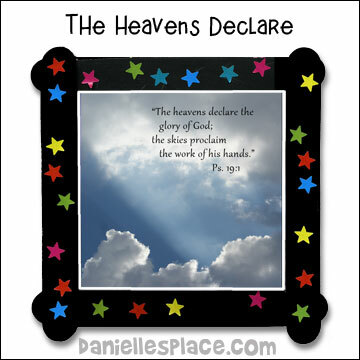 Have your children color the picture to reveal what God called the expanse. Take your children outside to look at the sky and clouds. Ask them what they see in the sky. If there are clouds, ask them if the clouds look like anything familiar. (Preschool) - Give your children balloons and take them outside. Tell them to see how long they can keep their balloons in the sky. Older children will enjoy playing with a partner. See which team of two children can keep their balloon in the air the longest. (Older children) Before class blow up at least 5 white balloon and 5 blue balloons. Divide your play area into three sections - clouds, sky and water in that order. Place all the balloons in the middle (sky) section. Divide your children up into teams of two - four players depending on the size of your room. Tell your children that the white balloons represent clouds and the blue balloons represent water. The object of the game is to divide the water from the water by blowing the white balloons into the cloud section above the sky and the blue balloons into the water section below the sky. They children are not aloud to touch the balloons with any part of their bodies. They can wave their hands to make wind or blow with their mouths. Time each team. The team that accomplishes the task in the shortest amount of time wins. Before each team starts ask the team how God created the sky - "he separated the water from the water". (Preschool Children) - Set up the playing area as described above but do not use teams. Just let the children try to blow the balloons in the right direction. Write the words to the Bible verse on the balloons, one word per balloon. 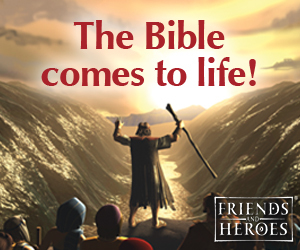 Use only part of the verse for younger children. Use the same teams as above. Write the Bible verse on the board. Mix up the balloons on the floor and on the word go teams take turns finding the balloons with words and placing them in order to spell out the Bible verse. The team that does it the quickest wins. If you have younger children just have them find the words and hand them to you. You can place them in order as the children find them. Bring in Graham crackers, cream cheese icing that has been dyed blue, and mini marshmallows. Have your children ice their crackers with the blue cream cheese and add marshmallows to one side of the cracker for clouds and use a fork to draw wavy lines on the other side for water. My name is Patty and I am the Director of Preschool Ministries at my church. Each level has different needs and abilities, so it is nice to use the same lesson and give one class just the coloring sheet, another class the story and coloring sheet, and the older ones the craft as well. The diversity of lessons helps me to find something for whatever topic we are covering. Thank you! This web site is so wonderful. I'm amazed at all the wonderful things you share with me. 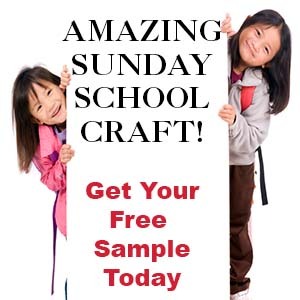 You are worth more than your membership fee any day, the patterns for the crafts are priceless!!!!! !